The J.M. 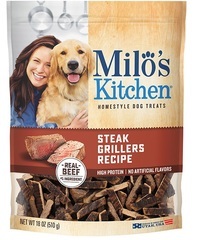 Smucker Company is voluntarily recalling some of its Milo's Kitchen dog treats because they may contain elevated levels of beef thyroid hormone. According to the FDA , if dogs consume high levels of beef thyroid hormone they may show symptoms of increased thirst and urination, weight loss, increased heart rate and restlessness. They say the symptoms should subside once consumption of the treats is discontinued, but prolonged consumption can cause vomiting, diarrhea and labored breathing. The FDA say there have been three illness reports. 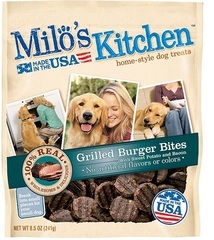 No other Milo’s Kitchen dog treats, or any other product manufactured by The J.M. Smucker Company, are impacted. Consumers are urged to stop feeding the treats to their dogs. Those who have questions or would like to receive a refund or coupon for a replacement product, should call 1-888-569-6767, Monday through Friday, between 9 a.m. and 5 p.m. EST or visit http://www.bigheartpet.com/Contact/ContactUs.aspx .